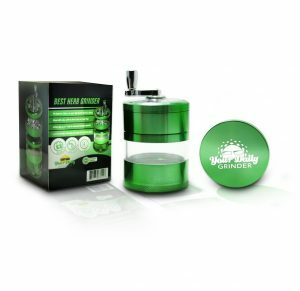 Have you ever wondered what it would be like to have your own personal grinder to use, wherever you are? 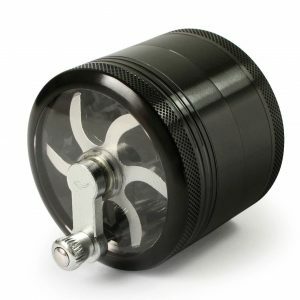 Luckily for you, crank weed grinders are suitable for that purpose, alongside a few other features that you can take advantage of. Some features that come alongside the best crank weed grinders are multi-layer filters and crank intensity. With multi-level filters, you won’t have to worry about chunks of marijuana in your final product, as it will have gone through several levels of filters to allow you to have the absolute, best result. The result will be a fine grain of marijuana that you can use to roll up a joint. The crank intensity is also a feature that is great to use. If you don’t want your result to be a fine grain, then you can slightly turn the crank, so that it doesn’t grind the weed as hard. Below, we will be reviewing some of the best grinders out there. As everyone has their own preference, we recommend that you read our reviews to see which one fits you the most. 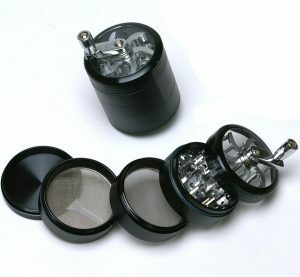 Bluesky is a crank grinder that comes with a 4-level filter. It is a quite heavy duty as it is made of high-quality aluminum and comes with an anodized case. The quality of the crank of this product is also quite high, allowing you to grind to your heart’s extent without worrying about it breaking on you. Lastly, if you have arthritis in your hands, then this is the product is the one to go for, as others have stated that this grinder is a lot easier to crank than others with this condition. Overall, this grinder is great for its price and the build quality is excellent as well. The grinder from Your Daily Grinder is also a product that comes with a high-quality build. This is because it is made of high-quality metal and is finished in five colors: green, silver, black, blue, and red. Alongside the original product, you will also get a pollen catcher which is added as a bonus. We consider this product to be one of the best out there as it has a clear, white case in the middle. This will allow you to see how much you have ground so far, and will also give you more storage for you to keep some of the ground material. This is so that you can keep it for later use, or you can use it as a temporary storage unit so that you can constantly grind without having to empty it often. Overall, we love this product due to its high-quality build and features, such as the clear case. 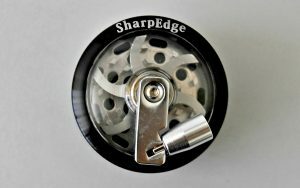 If you are looking for a crank that you can use roughly without facing the consequences, the SharpEdge hand crank grinder is the best choice for you. As the crank is heavy duty, it will be able to support heavy, rough use and won’t break for years. Just like the product above, this grinder comes with a clear case that you can use to store weed or see how much you have ground so far. The blades on this product are also very durable and will work just how it worked when you first bought it, even if a year or two has passed. Overall, this grinder is amazing if you are in it for the long run and want to use your grinder for at least a couple of years. Even if the handle on the crank breaks, you’ll still be able to use it, making the lifespan of this even longer. If you are looking for something unique compared to the other products reviewed in this guide, then we recommend that you take a look at this one. This grinder comes with diamond teeth instead of the standard aluminum teeth, making grinding a lot easier since the density of diamond is a lot higher than aluminum. It also comes with a cap that is made of strong magnets, making it easier to cap the grinder. This grinder comes with a clear lid on the top, something that should be added to every grinder on the market, that will allow you to see how much you have ground so far. Overall, this grinder has everything you’ll need, alongside more additions that you might find useful. 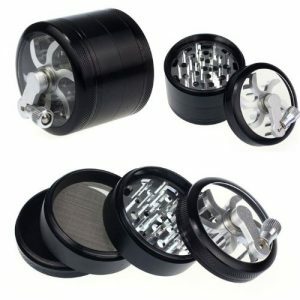 Although the most expensive on this list, this grinder must be the best one out there right now. It comes with diamond cut teeth, just like the product above, that will help you get a smooth grind and make sure that all the weed inside are ground. This product also comes with a strong magnet top to make sure that nothing spills over during the grinding process. Lastly, the entire grinder is made of aluminum and uses 100% CNC pieces to help make the product fit together perfectly for great symmetry. It’s also important to note that this brand stands behind their product and overs a 100% satisfaction guarantee, something that we recommend you take advantage of to make sure everything fits your needs. Overall, this is one of the better grinders out on the market right now and we highly recommend you get it. Everyone needs a hand crank grinder some time and having one for that special occasion is a huge advantage. From being able to hand crank your weed to fine grains to use in your joint, to being able to store weed inside the container inside, you’ll find a great purpose to put these herb grinders to good use.